I had returned to Perth early and, to be honest, was at a bit of a loss what to do next. I wasn't sure where to go given Western Australia is at the tail end of the summer and everywhere I've seen is in need of some serious rehydration. 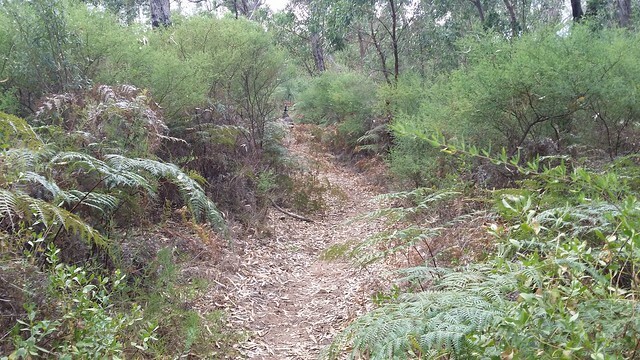 I was still keen to get back out into the Australian bush, but couldn't decide where. 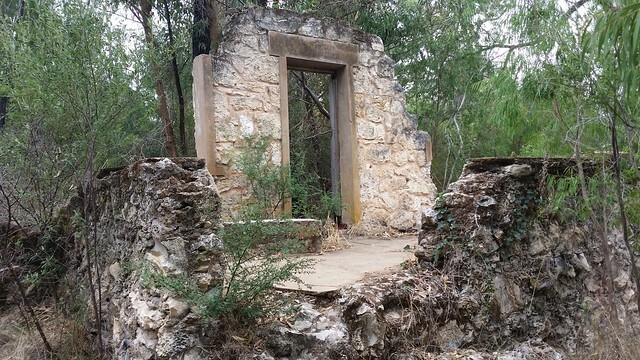 Then, my cousin's wife, Jamie, mentioned Yanchep National Park and after scouring the internet for walking ideas, I came across the Ghost House Trail. 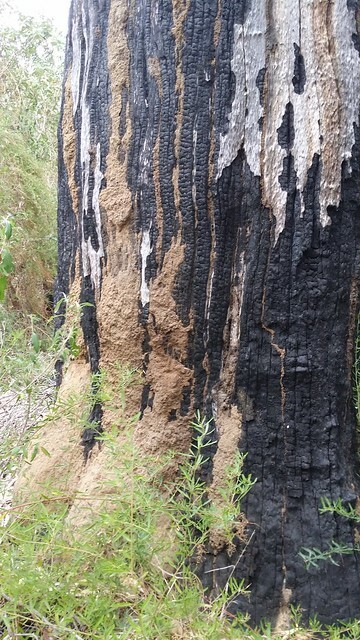 This was my first visit to Yanchep National Park. Being only a three quarter of an hour drive from where I was staying, it was a convenient place to check out for the day. Bank Holiday Monday, when I hit the road, there were few cars out, and I made good time. I paid the $12 park entry fee, parked up and went to the visitors centre to register for the walk. 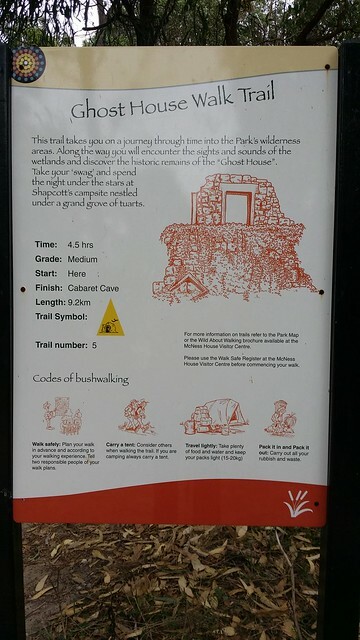 Within the park, walks over a few kilometres require you to fill out a form detailing your plans and emergency contacts. Were this the UK, I would consider it health and safety madness and overkill, but I guess here, aside from the usual risk of injuries like sprained ankles, there are things that could potentially kill you. 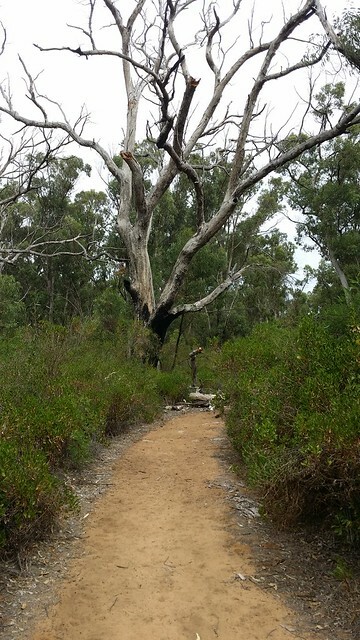 To start the walk from the Visitor Centre, you head down to where the two kilometre circular Wetlands Walk Trail laps Wagardu Lake (also known as Loch McNess). 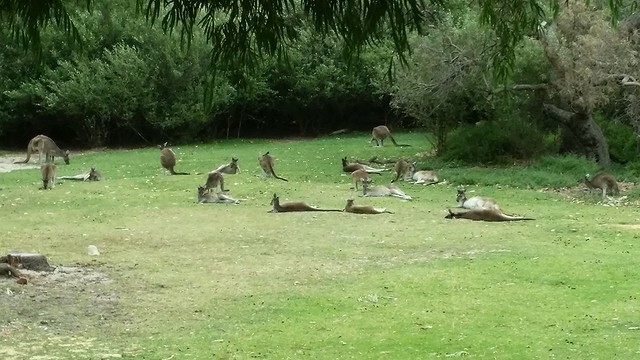 I passed a mob of kangaroos lazily enjoying the lower temperatures, no doubt, because I know I was! 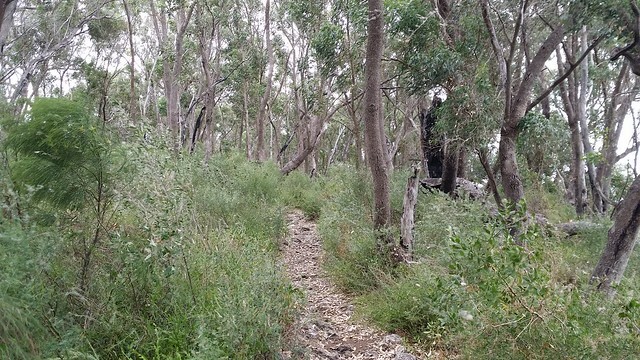 Today was overcast, and more suited to a spot of bushwalking. 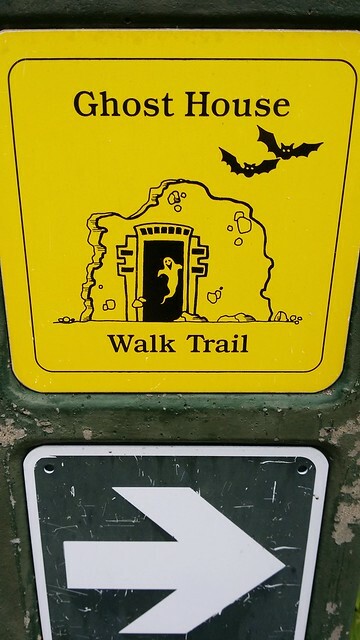 The lack of a decent paper map did have me guessing the way to the start of the path I was after. The one I had downloaded, through Memory Map was a scan of a paper copy and clearly many years old. I was on the right track, though. It did take longer than I anticipated before the turn off appeared with a signpost no one could miss. Immediately, you notice the difference from the Wetlands Walk Trail. 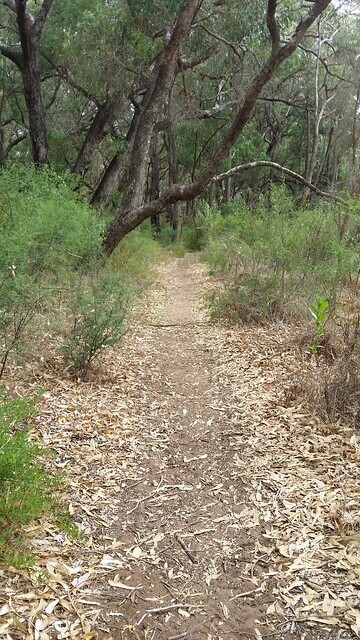 Gone are the board walks, the path narrows, and you have a sense of getting away from civilisation. The path is sandy, not deep like that of a beach or four wheel drive track but it is a minor niggle given recent experience. 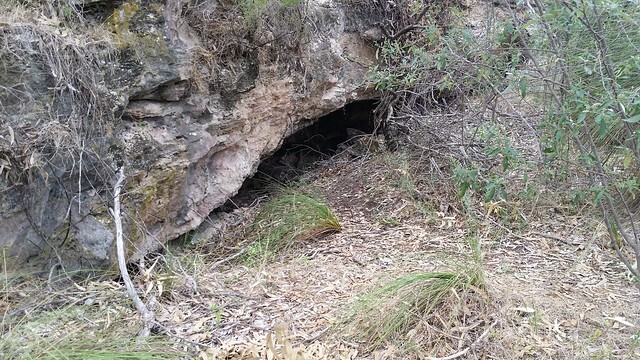 It is interspersed with sections of rocky limestone, a major feature of Yanchep, with its many caves. The track is easily followed. 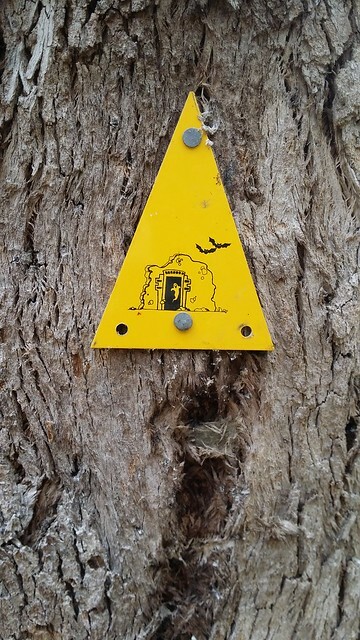 There was a familiarity following yellow markers, although the style was more comic strip than the aboriginal waugal of the Bibbulmun Track. As I got further in, I heard a thumping in the scrub land below. 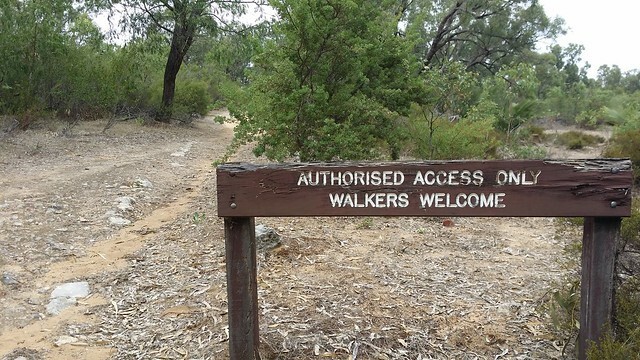 I figured it was some bushwalkers on a another trail and we were about to cross paths. 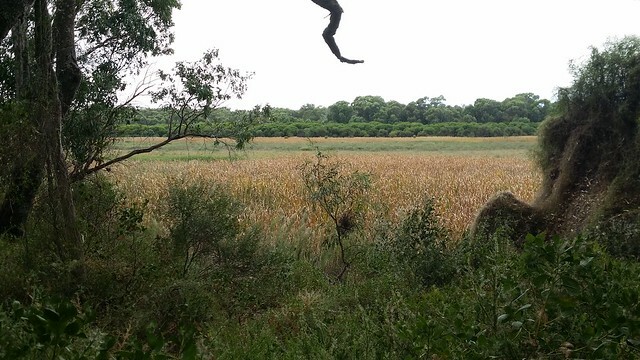 Instead, I was thrilled to see it was an emu oblivious to my presence, crashing along, to my right. It was a large male and he towered above me. He stepped out onto the track a couple of metres in front of me and although he intimidated me somewhat, I spooked him more and he ran off down the trail before I could reach for my camera. He wasn't too bright, though; just thirty metres later, I rounded a bend and took a step back when I almost bumped into him. Once again, seeing me, he was off, leaving me to take a hurried photo of him disappearing into the distance. I was buoyed by this encounter; Emu of Australia out trumps Pheasant of the UK any day! As the trail makes its way up around the top of Wagardu, it has its small ascents that give you a teasing glimpse of the lake below, through the trees. It isn't until you descend closer that you see it better. 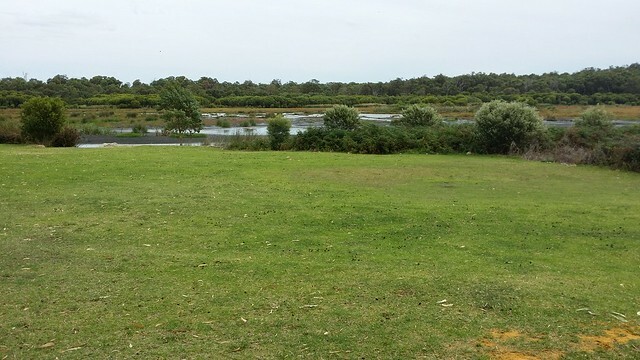 At the moment it resembles more a wetland than lake, though, and the winter rains can't come soon enough. At about four kilometres, you reach the Ghost House. There isn't much to say about it. A derelict square, one room, building with crumbling walls and a door way. I have tried to find out more about this structure and why it is worthy to have a trail named after it, but I can't find anything. 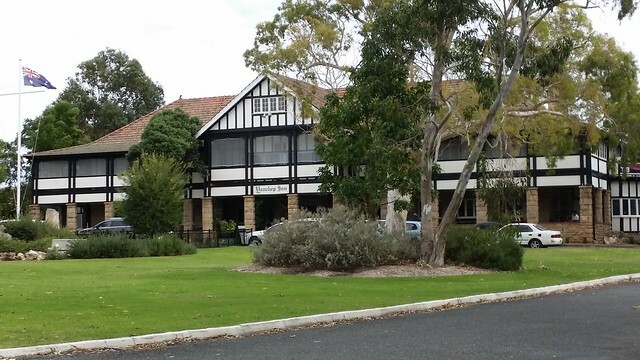 It's a shame that the signs and pamphlet supplied by the visitor centre talk of this "historic" building and then tell you absolutely nothing about it! If anyone reading this knows any more, please leave a comment to enlighten me! Moving on, the trail had, by now, looped round the top of the lake, and the return journey was about to start. I stopped for a break at Shapcott's Campsite. 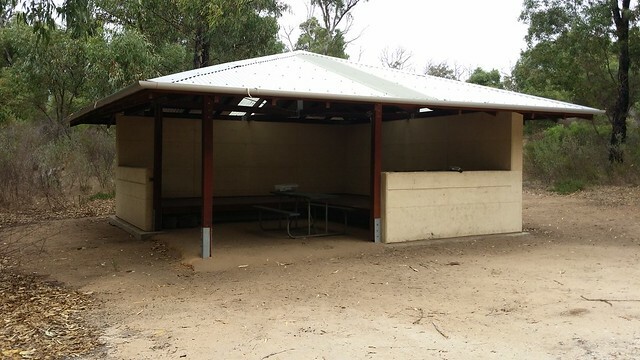 It consists of a toilet, picnic bench and a hut, with plenty of area to pitch a tent if you want a bit of privacy. It was located near a high face of limestone, and a cave, but the bush was too thick for me to get close enough to explore. I continued and came across another trail, and this piqued my interest. 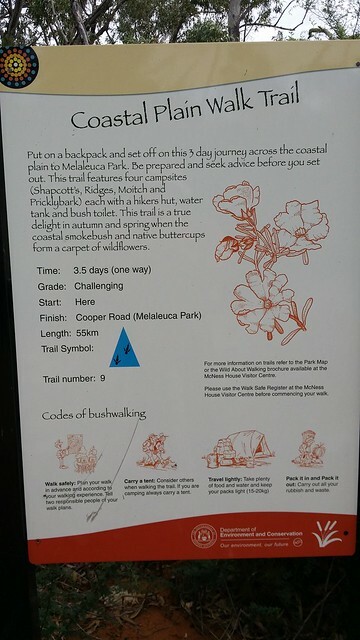 The Coastal Plain Walk Trail, a three and a half day walk of fifty-five kilometres. Once again, though, there is little information to be found about its origins and history, but it is one worth considering. I set off on the sandiest (is that a word?) 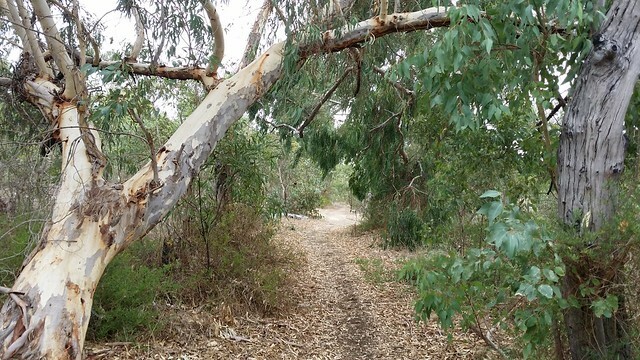 section of the path; there really is no getting away from it in Western Australia and no wonder the derogatory nickname for the residents is "Sandgropers"! No getting away from sand in WA! The trail takes you between some small hills, and to the verge you can see evidence of the limestone caves, with small fissures in the rocks. I made a mental note to return to the park at another time to explore some of the caverns that are open to the public. The trail also passes a couple of ugly concrete shelters, built to house radar equipment that defended Perth from attack during the Second World War. It finishes at the car park for Cabaret Cave. Once again, without a decent map, it takes some working out which way to go. 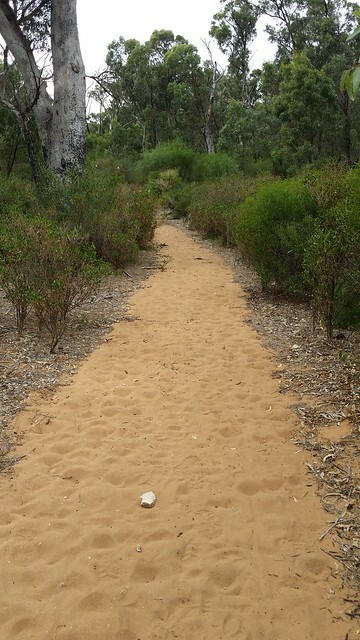 I followed the road, making for the Yanchep Inn. 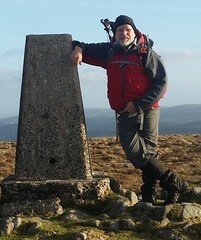 I didn't stop though, I wanted to off load my pack and sign out of the walk before I sat down for refreshment. 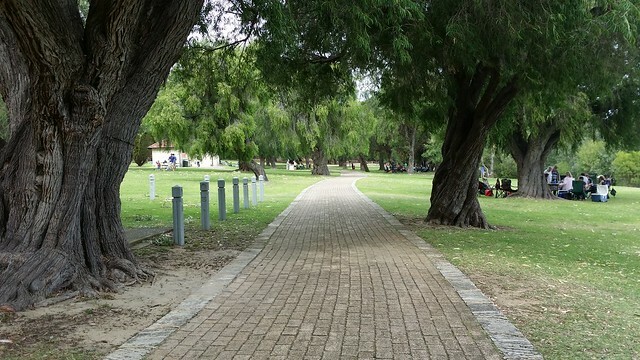 Around the side and out the back of the inn, you meet with the manicured lawns of the picnic area by the lake. It was now gone one in the afternoon, and there were plenty of families using the barbecue facilities and enjoying the amenities the national park had to offer. Signing off at the Visitor Centre took little time despite the throngs packed into it. The assistant spotted me amongst the crowds and she ushered me ahead of the queue to tick me off their list. All done, now, I was in the mood for a strawberry thick shake, at the cafe, to finish the outing. Not a bad walk, plenty to see, the Emu encounter a definite highlight and I'm sure that in the spring this route is alive with colour from the wild flowers. On the negative, I would appreciate a bit more information on the history of the area.